Susanna Leonard Hill features Perfect Picture Book Friday on her blog. This is a wonderful resource if you are wondering what books to give as gifts, needing material for a lesson, and mainly just perfect for those who love to read picture books. Here is a list of books by category. This is very handy for finding books for lessons in the classroom, or for finding books on a particular topic to discuss with your children at home. Each book listed has a link to a review and information about that book. There is also an alphabetical list. Synopsis: All Boris wants is a long catnap in his new cardboard box with no trouble whatsoever. But suddenly–STAMP, STAMP, scribble, scribble–the box is taped up and zoomed off to doorsteps all over the earth and beyond. . . . Every time Boris drifts off to sleep, someone opens the box and wakes him up. Beady eyes peek inside and loud voices shout, “This is NOT what I ordered! I DON’T want this cat!” (They want a prickly plant . . . giant teapot . . . or remote-controlled space butterfly.) This quirky cat tale proves there’s no place like a loving home–especially if that home happens to have a plumpish pillow perfect for snooooooozing. 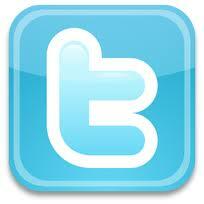 Resources: I didn’t find any resources on the Internet, but I have a few ideas of my own. 1. The illustrations in this book are wonderful. They are mixed media collages, so there is a lot of texture. 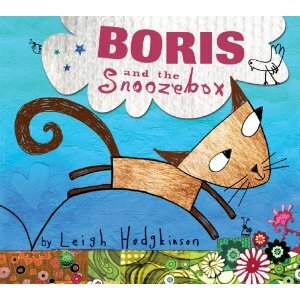 Since Boris spends a good part of the story in the cardboard box, I think children would like making their own version of the box that Boris travels in. They would each need a box and packing materials. A variety of packing materials would make it interesting. Bubble wrap, newspaper, cloth, corrugated cardboard, etc. Along with this, students would need to make Boris. Personally, I think it would be great to just have them draw him and add the textured look with crayons or colored pencils. 2. After reading the book, have students brainstorm other places and people that Boris could have been mailed to. Map them out and and choose what each person would’ve been expecting instead of a cat. 3. Have students make a map of the classroom or school. Give the desks or rooms an address-complete with the name of the town, state, and zip code. Make a box with a paper Boris in it. Address and send to one of the desk or school classroom addresses that they have created. The receiver of the box would write a note saying what they expected instead of Boris…and why they had particularly wanted the other item in the mail. Then they would send the box on to a different address, which could be easily changed using sticky notes. By the time the box had made the rounds of the classroom or the school, it would contain all of the notes. Students could map the progress of the box. If the box was sent from desk to desk, the notes stating what they had wanted in the mail and why could be a really fun creative writing project. The teacher could have the criteria set forth…such as give three reasons you wanted the item. Also, it would be good practice for formatting mailing addresses and for mapping. 4. Creative writing: If you were to receive a pet in a box, what would it be and why. Why I Like This Book: As each recipient turned Boris away, I wanted to turn the pages to see where he would go next, and to see where he would ultimately end up. I believe children will have the same reaction. Even though Boris is getting turned away, there is a fun, humorous element to every scenario. So while I did want Boris to find someone to love him…I got quite a few chuckles as he went along his box-in-the-mail journey. I loved the mixture of fonts and the placement of the text on the page. It added a fun element to the story. The illustrations were an extra treat for me. Leigh Hodgkinson’s mixed media collages were unique and appealing. I did go back through just to take in the detail of her artwork. While at the library this week, I saw this book displayed on a shelf. I was immediately drawn to the title and the cover. I was not disappointed when I read it. I just had to add it to the Perfect Picture Book Friday list. Synopsis: (from book jacket) With blue jays, brown trout, and yummy red strawberries, Baby Bear’s forest is a very colorful home. Join him as he explores the wonders of his lively, leafy world—with big Mama Bear always at his side. Opening: In the den’s dark wall, an opening slowly fills with light. A glow creeps in. “Who is warming me, Mama?”asks Baby Bear. “That is the sun,” Mama says. Baby Bear sees yellow. 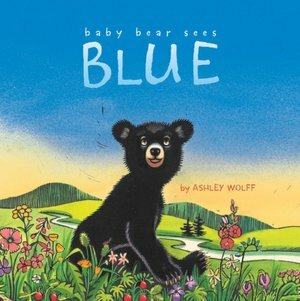 Why I Like This Book: Even though Baby Bear See Blue is a concept book, it has a sweet story. It is perfect for teaching colors to toddlers as baby bear explores nature with Mama Bear. Young children will be drawn to the vibrant illustrations as Baby Bear heads out of the den and spends his day discovering the colors of the forest. The relationship between baby and mama is adorable. This is a quiet book and makes for a wonderful bedtime read with the perfect ending for a deep sleep. Yes, I’m doing two Julia Donaldson books in a row. This one just had to be on the list. Synopsis: When a tiny snail meets a humpback whale, the two travel together to far-off lands. It’s a dream come true for the snail, who has never left home before. But when the whale swims too close to shore, will the snail be able to save her new friend? And a great big, gray-blue humpback whale. And this is a snail with an itcy foot. And gazed at the sea and the ships in the dock. And as she gazed, she sniffed and sighed. “The sea is deep and the world is wide! Why I Like This Book: The Snail and the Whale is a tale of an unlikely friendship. This book is cleverly written. I absolutely love that the snail leaves important silvery trail messages as he crawls. The messages are key to the story and are just the cutest thing ever! The rhyming text flows smoothly as a story unfolds and proves even the smallest of creatures can help a friend.The fact that it is written in flawless rhyme is always a bonus for me. The illustrations by Alex Scheffler are rich and vibrant. He catches the expressions of the characters perfectly. Warning: If you read this book, you will have to buy it for your personal library!!! 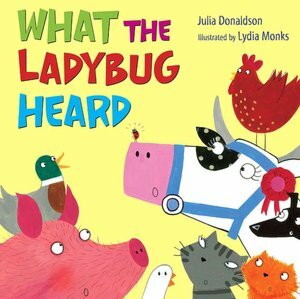 The book I’m reviewing today is What the Ladybug Heard by Julia Donaldson. Synopsis: (From Booklist) The ladybug in this rhyming story lives on a farm with the usual assortment of animals, each with his or her own special sound (“And the cow said, ‘Moo!’ and the hen said, ‘Cluck!’” etc. ), but “the ladybug never said a word” until she overhears “two bad men” plotting to steal the prize cow. The ladybug alerts the others and develops a plan to avert the heist involving each animal taking on the sound of one of the other farm animals. The men are caught, and the animals return to making their trademark sounds while the ladybug goes back to being silent. Filled with drama, lively action, and a large supporting cast of characters, this is a mini play more than a fully fleshed story. The appealing and brightly colored collage illustrations, rhyming text, and assorted animal sounds make it a natural for individual or group read-alouds. And a ladybug who never said a word. and “QUACK!” said the duck. Why I Like This Book: This is a playful, fast-paced rhyming story that flows seamlessly. The repetition of the animals sounds throughout the story will be an invitation for children to join in. I love the how the ladybug (who never says a word) comes up with the plan to outsmart the robbers. Monk’s colorful collage illustrations are full of detail that will invite a second look. If you read my reviews, you know that I read a lot of rhyming picture books. This has to be one of my favorites. There are times when I finish a book and I think, “Oh, how I wish every child could hear this book!” This is one of those books. It is a delightful treat!